Super 8 (2011) – Winning. Words. Fitting that Super 8 should begin with Amblin Entertainment’s iconic E.T. moon logo, this period sci-fi being the closest to Spielbergian magic that cinema’s gotten in a hell of a long time. With his ’70s-set throwback, director JJ Abrams has writ large a towering love letter to The Beard himself, holding his gilded back catalogue aloft like a cinematic holy text. But can Super 8 be more than just an anthem to a golden age of cinema? Well, hell yes and not quite. In our CGI-saturated world of 3D movies and spectacle for spectacle’s sake, Super 8 comes as a breath of fresh air. Abrams’ intentions are clear – he wants to take blockbusters back to the basics and honour those qualities that turned E.T. and Close Encounters into such beloved classics. It’s telling that he chose to set his movie in the 1970s, Super 8 harking back to that time when movies were stories, not just excuses for epic explosions. It’s an admirable endeavour, and it just about pays off. 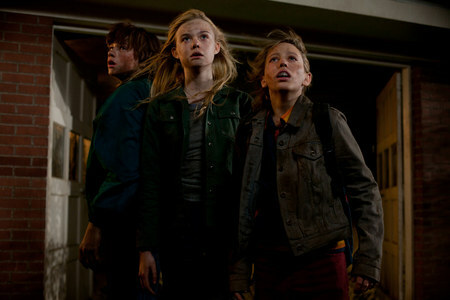 That’s thanks in part to the film’s young cast, a grubby gang of ragamuffins led by Joel Courtney’s likeable Joe. It’s 1979, and he’s just lost his mother in a freak accident – but he’s adamant that won’t stop he and his friends completing their latest low budget zombie movie. During a night of shooting, though, they’re caught up in a train disaster that will change their lives forever – not least because something has escaped one of the train’s containers. There are epic explosions, of course, but Super 8’s bigger plot machinations always come secondary to the characters. It’s a whisker shy of being a two hour movie, but this is a sci-flick in the old style, blessed with nail-on-head casting and sensitive storytelling. Super 8 knows it has to earn its set-pieces, and it does so by punctuating a quiet story about loss and friendship with jolting snatches of action. When Super 8 does take off, it’s a thing of wonder. That initial train crash is an earth-shaking, heart-in-mouth moment of awe-inspiring filmmaking, and it’s to Abrams’ credit that he doesn’t try to top it by creating ever-more ridiculous set-pieces over the film’s course. Each moment of peril brings its own surprises without relying on overcooked pyrotechnics. The similarities between Abrams’ movie, though, and the films he’s homaging are hard to ignore, and some of those nods do feel a little too on the nose. Composer Michael Giacchino mimics John Williams’ twinkly soundscapes almost too well, Joe’s town is the very definition of Spielbergia, and parent issues are ladled on like nobody’s business. It’s also a shame that Abrams isn’t interested in pushing the envelope further. When the inhabitant of that crumpled train container is finally revealed in all its glory, it’s something of a letdown. Instead of dragging Spielberg’s formula into dangerous new directions, Abrams is happy to rest comfortable in the shadow of his forebear, tipping that hat a little too far.